The title for this post is not mine, it belongs to Steve Reich. And he is one of a number of musicians that I have spent more time reading about (& thinking about) than actually listening to their work. Is that a bad thing? Who knows… Steve Reich, I am sure would be the first to admit he is not striving to be a popular artist – his work is challenging & while I am not trying to say he strives to be unpopular his work, unlike much popular music, does bear thinking about. I remember back when I was in the slow motion process of dropping out of university, reading about one of his works involving hanging microphones over guitar amps & setting a cycle of feedback in motion, as the mics moved like pendulums… Decades later I have still never heard that work, or even a recording of it, but I have many many times thought about hearing it, such that it is a familiar sound to me…. So what brought on this reflection on music as a gradual process? 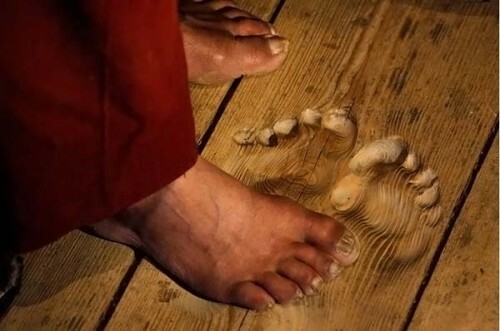 Two things; first the photo above; that is the footprint of Hua Chi, a 70 year-old Buddhist monk who has been praying in the same spot at his temple in Tongren, China for over 20 years. And when I say pray I mean he performs his prayers 3000 times a day…. So whats the rush again?